Millions of women each year find themselves in relationships with controlling or abusive partners and don't know what to do, or even what's wrong. A woman may feel anxious, inadequate, intimidated -- and as if she is walking on tiptoe. And she may find herself trying harder and harder to make things right without ever being successful. Ann Jones and Susan Schechter bring together their more than fifteen years of experience working with women in abusive relationships to offer an eyeopening new analysis of controlling partners and a wealth of empowering information for women who want to change their lives for the better. 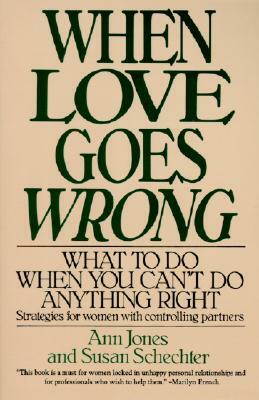 Full of moving first-person stories, When Love Goes Wrong shows women what their options are in or out of the relationship, provides concrete guidance on finding safety and support for themselves and their children, and includes a comprehensive list of agencies offering information or assistance.